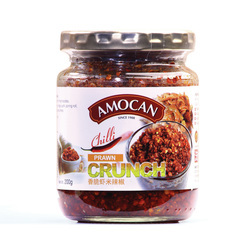 Made by refined palm oil, Chili, seaweed, sugar and salt. 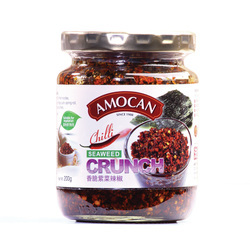 Chilli seaweed crunch can be eaten straight from the bottle with laksa, fried noodles, fried rice, porridge, sushi, spring roll and vegetable. Crispy Prawn chilli can be eaten straight from the bottle with laksa, fried noodles, fried rice, porridge, sushi, spring roll and vegetable. Satay sauce can be eaten straight from the bottle with meat, fried noodle and fried rice. Satay sauce can use to marinate meat.